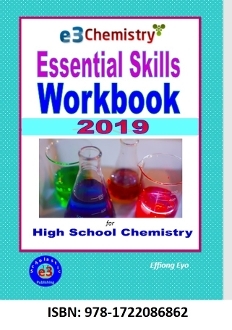 A highly organized high school chemistry workbook with 61 different worksheets, each consisting of many sets of questions on relating concepts to test students knowledge and understanding in several essential areas of chemistry.
. Comprehensive for a whole year of class work and homework PLUS final exam practice.
. Work on question sets for each concept you are learning. This book is used by teachers as a classroom instructional material. It does not have the two practice NYS Chemistry Regents exams. Therefore, it's has 50 fewer pages than the Regents Workbook. or non-Regents chemistry in New York.